This blog was written for the Ambition AXA Awards. As the Ambition AXA Awards work on unearthing some talented treasures among our young population, it seems like a good opportunity to shine a spotlight on a hidden force at work in the British economy. A million budding business people have passed through Young Enterprise’s Company Programme and they are out there turning the wheels of national prosperity. Their existence is sometimes ruefully referred to as the ‘best kept secret of the UK education system’ and so I propose to use this blog to highlight these extraordinary young people and let you hear some of their voices. I confess I have an ulterior motive. I want to see enterprise education being expanded in classrooms. This subject has come to mind because I know that young people across the country are currently rushing to submit their entries before the October 14 deadline for the Ambition AXA Awards. I hope the stories of the young people I am about to relate will serve as an inspiration to potential entrants to the competition as they hasten to fill out their forms. Every year, under the Young Enterprise Company Programme and the associated Start-Up Programme in universities, more than 30,000 15 to 25-year-olds get the chance to run their own real firms for 12 months with the guidance of volunteers from 3,500 companies. Many alumni go on to outstanding entrepreneurial success and, as I hope to prove to you in this piece, they are making a striking contribution to reviving the UK’s fortunes. Take Newcastle University student Adam Soliman. Realising the downturn would bar him from a career in high finance, he got help from Young Enterprise in 2009 to turn his hobby of tea drinking into a business. Frustrated with the ‘bland and bitter’ range of leaves on offer, he launched his own importer and blender under the brand name Charbrew, based in Thornton-Cleveleys, Lancashire. Ayrshire-based educational book publisher, Giglets (an old Scots name meaning laughing children), first emerged in 2007 as a Young Enterprise Scotland project created by a group of teenagers in a secondary school. Among them was Craig Johnstone, now managing director, whose dream it is to be the next Richard Branson,and Multimedia Director Tom Brodie-Browne. 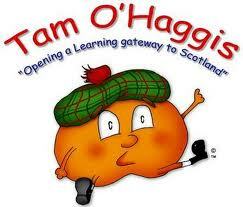 Their books are based around the adventures of lovable character Tam O’Haggis. Other senior Young Enterprise Alumni endorse Justin’s view. All the young people I mentioned above are truly enterprising. They have the potential to go to the very top. In their various ways, they demonstrate the ambition, leadership ability, capacity for innovation and the dedication to provide excellent customer service that has given their businesses outstanding potential for growth. These are all qualities which will be necessary to win the enterprise category of the Ambition AXA Awards competition. Let battle commence!